Ahhh, spring, my most beloved season. The thunderstorms, the 70 degree weather (I’m not a fan of sweating so I think all of you “I LOVE 90 degree weather!” people are nuts), the smell of the springtime air, and the flowers– daffodils, crocuses, and, of course, peonies are my favorite things about spring. 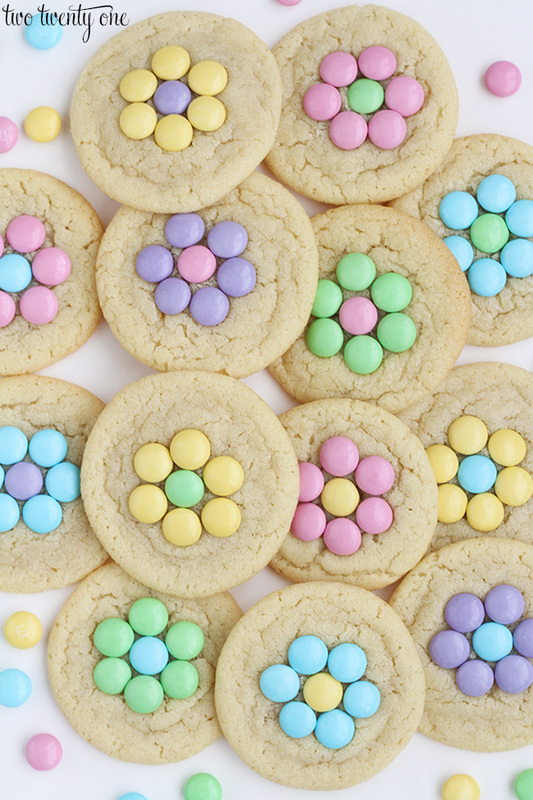 I figured it would be fun to whip up some candy flower sugar cookies in honor of spring. After I made these beauties, I let Owen try one. Then, I put the rest in a container and sat it on our kitchen countertop. Immediately after he finished the cookie, I could hear him in the kitchen saying “cookie … cookie … cookie”. I walked into the kitchen to see him on his tip toes, reaching for the container. He whipped around toward me and feverishly started saying and signing “more please … more please”. That’s when I discovered that teaching him to say “cookie” probably wasn’t the best idea, and that I now need to hide all future cookies in a cabinet so they’re not within eyeshot. Like everything I make, these are very easy to execute. I whipped up a batch of my sugar cookies, and while they were baking I configured the flowers. As soon as I took the cookies out of the oven, I pressed the M&Ms into the center of each cookie to form the flowers. Preheat oven to 350 degrees. Combine flour, baking soda, and baking powder in a bowl. Set aside. In a separate bowl, cream butter and sugar together until smooth. Add egg and vanilla. Blend in dry ingredients. Roll dough into 1 inch balls, and then roll into oblong balls. Slightly flatten the dough between your hands. Place on baking sheet. Bake for 10-12 minutes. Remove from oven. 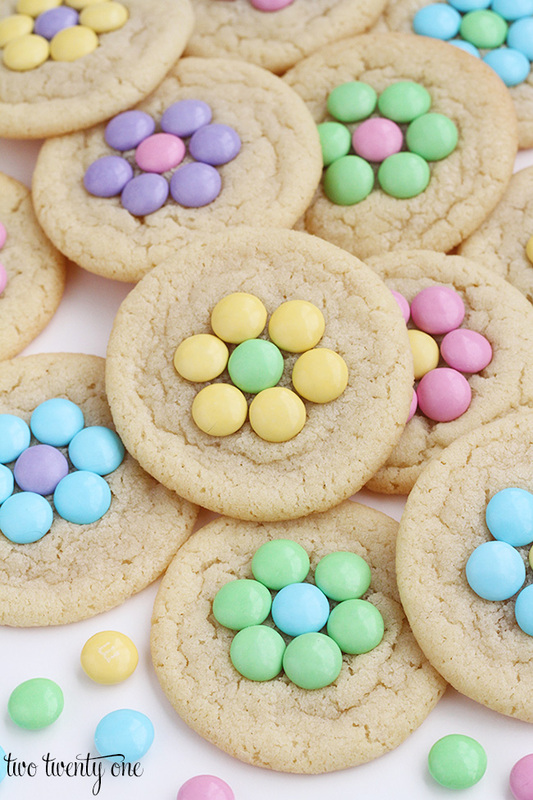 Press 7 M&Ms into the center of each cookie to form the flowers. 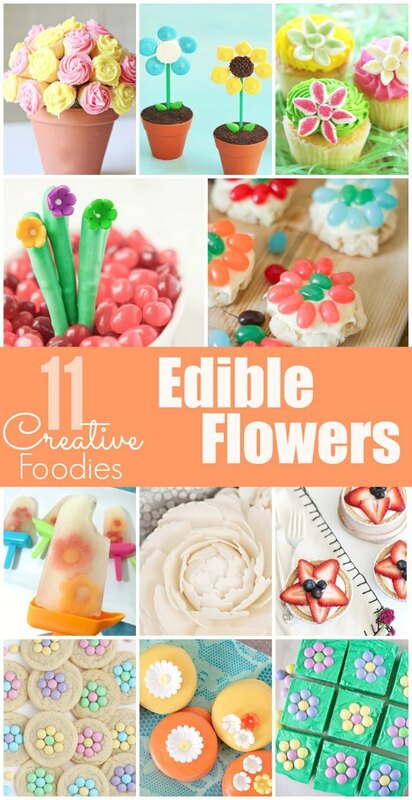 I’ve partnered up with 10 other bloggers to share some delicious edible flower recipes. So make sure you head over to their blogs and check out their tasty creations! These look yummy. I will have to try the recipe. My kind of cookie – pretty and yummy. They look great (I really like the pastels) and easy to make. My kind of cookie! Chelsea, these cookies are so pretty! I’ve been sharing your recipe all over the place. Many moms will be making them for their springtime parties! These cookies look so sweet and pretty! I should make these with my daughters — they’d love it! Thanks for sharing your recipe at Motivation Monday on Mom Home Guide! 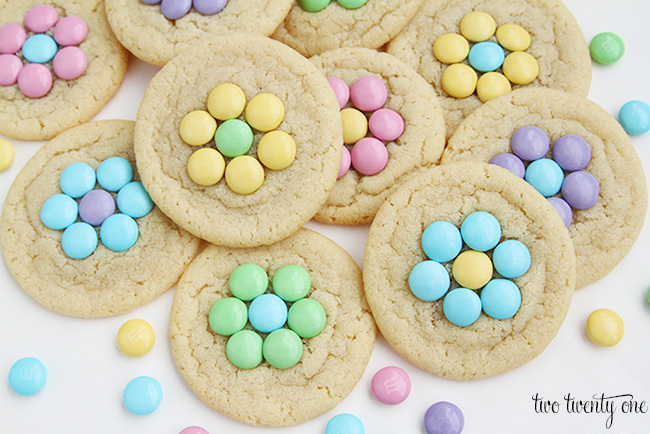 Oh my goodness, those flower cookies are just the cutest ever! Those are too perfect for spring anything! Thanks for linking up with Delicious Dishes Recipe Party! These are so beautiful! They look too good to eat:-) Perfect for spring or Easter.